An Armenian lawmaker managed to beat the world’s reigning chess champion Magnus Carlsen who is visiting Armenia these days. 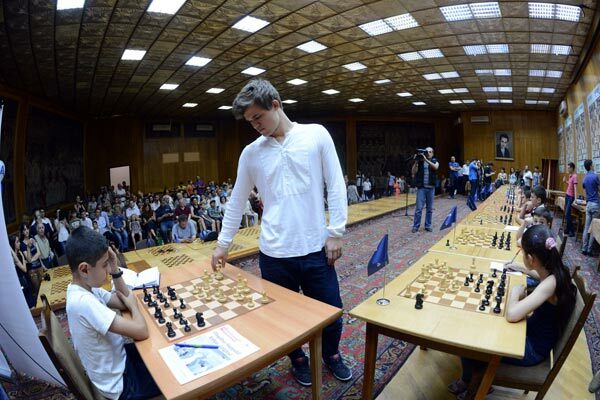 Armenpress reports that blitz games between Carlsen and a number of Armenian lawmakers took place at the Cafesjian Center for the Arts in Yerevan on Sunday. In one of the games that took three or four minutes MP Tachat Vardapetyan managed to beat the Norwegian. Vardapetyan represents the parliamentary faction of the ruling Republican Party of Armenia led by President Serzh Sargsyan, who also heads the country’s chess federation. Carlsen, a 23-year-old chess ace who tops FIDE’s current player rankings, is on a three-day visit to Armenia at the invitation of the Acronis information technologies company and the Initiatives for Development of Armenia (IDeA) Foundation. A visit to the Tatev monastery, one of the most favorite tourist attractions in Armenia situated in the country’s southern Syunik province, is on the schedule of the Norwegian grandmaster’s visit that is due to end on June 24.